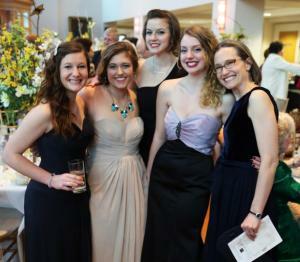 On Saturday, March 25, experience the fine arts come alive for the 7th Annual Friends of Fine Arts Gala at Brevard College in The Porter Center for Performing Arts. Tickets to the gala are $75 (tax-deductible, up to $45) each for the general public. Call 828.884.8211 or stop by the Fine Arts Office in Dunham Music Building for more information. The annual FOFA Gala makes it possible for students studying the arts to take learning outside of the classroom and into the realm of experiential education. The evening begins with a concert featuring pianist Robert Blocker, Dean of Music at Yale University, who will be accompanied by the Bela String Quartet from the Yale School of Music in performances of two Mozart Piano Concertos, “No. 11 in F Major, K.413” and “No. 12 in A Major, K. 414.” In addition, the Brevard College Chamber Singers, conducted by Dr. David Gresham, will perform Mozart’s “Missa Brevis in G Major, K. 140.” Admission to the concert is free and open to the public. At 6 p.m., the Gala begins with appetizers, complimentary wine from Food Matters, dinner with cuisine from around the world, arts, a live auction and dancing. Live auction items include selected art pieces from local artists, a photography class, a catered Dinner with Friends at the home of Brevard College President David Joyce ($1,200 value), a Tornado Club membership ($2,550 value), weekend getaways at Lake Toxaway and Bald Head Island, and much more.The funds raised, including ticket sales and donations, are used in conjunction with other Friends of Fine Arts donations to give students opportunities that would otherwise not be available. FOFA donations allow students to attend conferences and competitions, bring guest lecturers to the College, and supply students with the equipment and tools they need to succeed. Fine Arts activities sponsored by FOFA include: sending students to the National Association for Teachers of Singing and the Southeastern Theatre Conference, sponsoring museum trips, spearheading Spiers Art Gallery renovations, and hosting guest clinicians and performers.